The Internet Research Agency (IRA) carried out the earliest Russian interference operations identified by the investigation-a social media campaign designed to provoke and amplify political and social discord in the United States. The IRA was based in St. Petersburg, Russia, and received funding from Russian oligarch Yevgeniy Prigozhin and companies he controlled. The IRA later used social media accounts and interest groups to sow discord in the U.S. political system through what it termed “information warfare.” The campaign evolved from a generalized program designed in 2014 and 2015 to undermine the U.S. electoral system, to a targeted operation that by early 2016 favored candidate Trump and disparaged candidate Clinton. The IRA’s operation also included the purchase of political advertisements on social media in the names of U.S. persons and entities, as well as the staging of political rallies inside the United States. To organize those rallies, IRA employees posed as U.S. grassroots entities and persons and made contact with Trump supporters and Trump Campaign officials in the United States. The investigation did not identify evidence that any U.S. persons conspired or coordinated with the IRA. 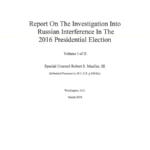 Section II of this report details the Office’s investigation of the Russian social media campaign. 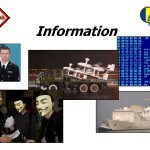 A 2013 training presentation from the U.S. Army TRADOC G-2 Intelligence Support Activity (TRISA) Hybrid Threat Train the Trainer course detailing information warfare concepts. The PLA’s sustained modernization effort over the past two decades has driven remarkable transformation within the force and put the creation of modern command, control, communications, computers, intelligence, surveillance, and reconnaissance (C4ISR) infrastructure at the heart of the PLA’s strategic guidelines for long term development. This priority on C4ISR systems modernization, has in turn been a catalyst for the development of an integrated information warfare (IW) capability capable of defending military and civilian networks while seizing control of an adversary’s information systems during a conflict.